Remember when you were a kid, and your mum would help you make lemonade on a hot day? You would get a little table ready with your cups, your pitcher of juice, and your home-made “Lemonade for sale” sign. The adults would dutifully line up, buy a cup, and make jokes about how it was so hot you could fry an egg on the sidewalk. Stepping out into the searing heat that is Montréal this week, I wouldn’t be surprised to see some street omelettes forming…that is, if it weren’t for the tropical humidity. So, for those of us who have moved on from lemonade, what wine should we drink to beat the heat? Lemonade is high in acidity, and generally served ice cold. This makes it thirst-quenching, with a cooling sensation. When choosing wine for a hot summer’s eve, this same refreshing quality is a must. Look for wines that can be chilled down to 8 to 12°c. These tend to be lighter in body, and predominantly white or rosé in colour. Combine this with crisp, lively acidity, and tart fruit flavours, and your palate is sure to feel invigorated. Our bodies produce sweat to cool us down in hot weather. This process dehydrates us, so we need to drink more. Alcohol is a diuretic. It makes us ***ahem*** expel more liquid than we are taking in. Drinking lots of alcohol in hot weather is never a good idea. This wine style hails from the cool, rainy northwest of Portugal. While its literal translation is “green wine”, the name refers to the youthfulness of the wine, rather than its colour. Vinho Verde is bottled a mere 3 to 6 months after harvest. Vinho Verde can come in white, rosé, and red. The most popular exported style is white wine. It is made from a blend of indigenous white grapes including Alvarinho, Avesso, Azal, Arinto, Loureiro, and Trajadura. Vinho Verde generally has subtle effervescence, tangy acidity, a light, delicate structure, and low 8.5 to 11% alcohol. Aromas and flavours are usually quite restrained, ranging from marginally ripe stone and citrus fruit, to floral, and sometimes mineral nuances. German Riesling is an obvious choice for high quality, lower alcohol white wine with racy acidity. To read more about this, click here. But perhaps you don’t think of the Niagara region when you reach for a Riesling? This is a situation which needs to be rectified…immediately. Niagara produces some beautifully precise, bracing, light-bodied Rieslings in styles ranging from bone-dry to subtly sweet. Highly aromatic, brimming with lemon, apple, peach, and sometimes tropical fruit notes, these wines are dangerously drinkable. 10.5 to 12% alcohol is the norm. If it’s bubbles you are after, Prosecco often sits at a modest 11%. Made from the Glera grape in the north east of Italy, this frothy semi-sparkling wine is softer on the palate than Champagne or Cava. It boasts fresh acidity, pretty pear, peach, and floral aromas, and a very light palate profile. Be sure to read the label before picking up a bottle though, as the term “dry” is actually (confusingly) used for the sweeter styles. If you want something literally dry, look for the word “brut”. A subtly sweet style will be called “extra dry”. My favourite rosé wines are generally from the sunny south of France or similarly hot regions. Alcohol tends to creep up to 13% or higher here. I would be lying if I said this stopped me, but I definitely try to keep better track of consumption when imbibing the pink stuff. For you red wine lovers out there, lighter styles (~12%) with vibrant acidity, and mouthwatering fruit flavours can be found in Cabernet Franc, Gamay, and Pinot Noir. The Loire Valley and Niagara make great cool climate examples. Cabernet Franc has lovely raspberry fruit flavours, but can be quite vegetal (leafy, bell pepper notes). This quality can be very attractive, when amply balanced by fruit. Beaujolais is king for the Gamay grape. Gamay features pretty red berry and violet notes. It ranges from light bodied, with silky tannins, to grippy and powerful. For the lightest styles of Beaujolais, look to the villages of Brouilly, Chiroubles, or Fleurie. Cool styles of Pinot Noir can be found around the globe. Burgundy is the best known and arguably the finest region, but prices are creeping ever upward. For best value options, look for the generic, region-wide designation of Bourgogne AOC, or southern Burgundian village wines from Mercurey, Rully, or Givry. All three grapes can be served quite cool, at around 14 to 16°c. Recommendations: Agnes Paquet Bourgogne Rouge, Domaine Michel Juillot Bourgogne Rouge, Thierry Germain “Domaine Roches Neuves” Saumur-Champigny, Bernard Baudry Chinon. A glass of wine, a glass of water. This golden rule has always stood me in good stead on nights where temptation gets the better of moderation. Cool climate has become a bit of a buzzword for wine enthusiasts in recent years. Marginal climates on the very brink of where grapes can successfully ripen are increasingly being sought out by growers conscience of the long term potential they offer. As temperatures continue to rise, and drought conditions worsen in many hot growing areas, cooler climates offer an attractive solution to climate change. The current fashion in wine geek circles is for crisp, elegant, lighter wine styles that these sites yield. Germany’s original vineyards are said to have been planted some 2000 years ago by the Romans. Much like in Burgundy, the powerful monasteries of the Middle Ages are credited with identifying many of Germany’s finest terroirs. In the 18th and 19th centuries, German wines were as highly prized as their counterparts in France. Queen Victoria was well-known for her love of Rheingau wines from the Hochheim area. In many of his excellent books, wine writer Hugh Johnson sings the praises of the thrilling Rieslings of the Mosel and the Rheingau. So why are German wines so hard to find on liquor store shelves and restaurant wine lists these days? Yes, there were some dark days for German wine in the difficult aftermath of the the second world war. Firstly, a grape called Müller-Thurgau was widely planted through-out Germany. This variety was created by crossing two separate grapes (one being Riesling) in order to obtain a new, early ripening, high yielding grape that thrived in a wide range of soils and climates. The downside was that Müller-Thurgau produced a fairly bland, neutral white. The second issue was the rise in popularity, first domestically, and then internationally for a very sweet, insipid style of white wine called Liebfraumilch (think Black Tower, Blue Nun, Deinhard). As these inferior wines proliferated, so to did mass consumer perception that this was the extent of Germany’s wine-making abilities. And stereotypes, once firmly established, die hard. Germany’s quality-minded wine producers never ceased producing excellent wines, and wine connoisseurs never ceased drinking them; these wines just became specialty products for those “in the know”. As the trend toward drier white wine picked up steam in the 1980s and 1990s, Liebfraumilch sales waned and German wine began to disappear from larger liquor store shelves. Meanwhile in Germany, a quality revolution was quietly underway. Wine producers increasingly turned back to Riesling, began experimenting with sweetness levels, and singling out their best terroirs in single vineyard bottlings. Today, the quality coming out of Germany is second-to-none, but the average wine drinker wouldn’t know that…because they can’t find any. Riesling is praised by wine experts the world over, for its exceptional cellaring capacity and ability to express terroir. In simpler terms, the Riesling grape is very high in natural fruity acid. Acids act as a sort of preservative, allowing wines to maintain the vibrancy of their aromas and flavours over time. Riesling is rarely subjected to wine-making techniques (like malolactic fermentation or new oak ageing) that alter wine’s flavour profile. They tend to be light in body and delicate in texture. German Rieslings are often highly fragrant with aromas that range from apple, lemon, white flowers, and wet stone (in drier wines from the coolest areas) to intense honeyed, peachy, spiced notes for later harvested and/or warmer climate wines. There is almost five times more Riesling planted in Germany than in any other country world-wide. The Riesling grape excels in all styles, from sparking, to still; from bone-dry to lusciously sweet. Riesling’s high acid lends itself well to the production of quality sparkling wine. Its thin skins make it susceptible to botrytis (aka noble rot), a fungus that shrivels the grape berries intensifying sweetness and imparting interesting flavour compounds. The sweet German dessert wines made from partially to fully botrytised grapes are among the most complex, sought after wines in the world. * Just for to make things more confusing, Kabinett and Spätlese wines can also be fermented dry (rather than have the fermentation halted while residual sugar remains in the wine, as is the case with good quality sweet wines). You will see the word Trocken on these labels. Germany is the northernmost major wine-producing country in Europe. Its climate is cool and continental for the most part. Grapes grown in cool climates accumulate sugars more slowly. They require a longer growing season to fully ripen. Germany’s vineyards lack the abundant sunshine of more southerly origins, but they are blessed with warm, dry fall weather allowing the grapes to hang long on the vines. Grapes that ripen slowly like this tend to be fresher, with brighter fruit, and more complex (often mineral-laced) aromatics. The favourable fall weather alone isn’t sufficient to ripen grapes in the coolest German vineyards. In places like the Mosel Valley, Riesling thrives due to the perilously steep slopes upon which it is grown. These sharp inclines give more direct sunlight to the vines therefore increasing the rate of photosynthesis. Rivers also play a major role in tempering chilly German weather. Water maintains stable temperatures far long than air. In cool climates, rivers act as heat reservoirs. All of Germany’s major vineyard areas grow along the banks of the Mosel (and its tributaries the Saar and Ruwer), the Rhine, and the Main rivers. Although Riesling is the best known German wine grape, many other varieties flourish here. In fact, Germany is the third largest producer of Pinot Noir in the world. Called Spätburgunder (sh-pate-boorgunder) here, the style varies widely from region to region but often features a pale garnet colour, crisp acidity, tart red fruit flavours, light to medium body, and smooth tannins. These vibrant reds offer fantastic value for lovers of earthier, fresher Pinot Noir styles. For tangy, silky versions look to the Ahr, Franken, or Rheingau. For bolder, fruitier styles, try Baden or Pfalz. White Pinot grapes, namely Pinot Gris (aka Grauburgunder) and Pinot Blanc (aka Weissburgunder), are widely grown in the Rheinhessen, Baden, and Pfalz. Both grapes can be quite neutral and lean. However, when not over-cropped, and when vinified with care, they are both lovely, textural wines. Pinot Blanc tends to have firmer acidity, while Pinot Gris is more fragrant. Great German Pinot Gris is powerful and concentrated, with notes of ripe pear, tropical fruit, and spice. Pinot Blanc can be quite nutty and citrussy, with lovely freshness. The single most important attribute a wine must have to pass muster with me, is balance. All elements that one can smell and taste must seem harmonious to the nose and palate. On a balanced wine, the aromas, the flavours, the acidity, the alcohol, the tannins and so forth all work together like an orchestra to create one beautiful sound from many different instruments. Whereas, on an unbalanced wine, certain aspects will seem jarring, and out of synch. I regularly taste high acid wines with little to no sweetness, and find them so lean and austere that they provide little drinking pleasure. Where acidity is high, as with Riesling, residual sugar can provide an attractive counter-weight, enhancing the fruity flavours. Before dismissing the sweeter Riesling wine styles, try them against bone-dry Rieslings and see for yourself. I am constantly met with wine lovers who swear they only drink dry wines, only to prefer a slightly sweeter style when given a selection to taste. Also, high acidity levels mask the perception of sweetness. You may think your favourite wine is bone-dry, only to find it is slightly sweet. Next time you drink a bottle of Champagne, check the sugar level. Cool climate wines struggle to ripen and therefore never attain very high alcohol levels. In the case of sweeter wines, the arrested fermentation process means that not all the sugar has been transformed into alcohol resulting in even lower alcohol levels. German Riesling ranges from 5.5% alcohol for the very sweet wines, up to 12% for the driest examples. Even the red wines rarely exceed 13%. For me, German Riesling is the perfect hot summer’s lunch wine. Its vivacious acidity quenches your thirst, and its low alcohol won’t leave you yawning. Before you race to the store to buy the first German wine you see, there are some basic rules to follow. Unfortunately, syrupy sweet, characterless German wine still exists today. Avoid the cheapest options (in this market that pretty much means everything under 15$). And if you really and truly don’t like sweetness in your white wine, scan the label for the word trocken. If you are keen to try German sparkling wine (called Sekt), look out for a mention of origin on the bottle. Cheap German Sekt is truly dreadful stuff, with a heavy, candied sweetness. The grapes can be sourced from anywhere in the EU, so do not reflect German vineyard fruit. For dry to sweet wines, if you prefer a very light, delicate style with elegant, tangy fruit, mineral and floral notes look for wines from the Mosel Valley or Nahe. If you want something a shade more powerful, steelier in structure, but equally racy, Rheingau is for you. Finally, if you want more rounded acidity, riper fruit and spicy notes, the Pfalz region offers this an abundance. Incredibly lively white with moderate intensity of red apple, honey and ripe lemon aromas. Piercing acidity offsets the subtle sweetness nicely on this delicate, light-bodied white. The finish is clean, and fairly brimming over with juicy, tangy fruit. Crafted in a “dry” style, the 9g/L residual sugar is barely perceptible here. This is a classically styled Rheingau with its bracing acidity, firm structure, and hints of peach, lemon, and stony minerals. This zesty white is a sure to get your taste buds jumping. Where to buy: SAQ (19.25$). Restrained, yet elegant on the nose with subtle pear, green apple and floral notes. This charming, biodynamic Pinot Blanc really comes alive on the palate. Crisp, yet rounded acidity, an attractive layered texture and lingering saline hints on the finish. Lovely complexity on the nose. Slatey minerality is underscored by delicate floral notes, yellow apples and hints of petrol. Notes of raw honey and peach develop with aeration. The palate is silky and light, yet impressively concentrated, with racy acidity ably matched by incredibly vibrant fruit. The finish is long and mineral-laden. After a fabulous dinner in the gracious company of Christian Seely, managing director of AXA Millésimes, and Corinne Ilic, AXA Communications Director, we headed to bed with visions of 2005 vintage Château Pichon Baron dancing in our heads. In our rooms, a document awaited us. The next morning, we were set to visit another AXA property: Château Petit-Village in Pomerol. The document contained instructions, starting with the day’s objective, namely “to create a blend from 7 samples of pure individual grape varieties from the 2017 vintage”. Many people equate Bordeaux to Cabernet Sauvignon. However, Cabernet is only one of six grape varieties permitted for Bordeaux reds. These wines, barring a few exceptions, are always blends of two or more grapes. Moreover, Cabernet Sauvignon is not the most widely planted red grape in Bordeaux. That honour goes to Merlot. Bordeaux reds, barring a few exceptions, are always blends of two or more grapes. The most acclaimed vineyards of Bordeaux are divided into those on the left bank of a large body of water, the Gironde Estuary (and its tributary, the Garonne), and those on the right bank of another tributary, the Dorgogne river. On the left bank, Cabernet Sauvignon is the principal grape in the majority of fine wine blends. On the right bank, Merlot reigns supreme, with Cabernet Franc as its blending partner. Perhaps you are wondering why Bordeaux wine producers blend multiple grapes together in their wines? Why not focus on individual varietals as they do in Burgundy and elsewhere? There are many reasons. Two of the most important are related to climate and soil conditions. Each grape type has its own specificities. If you were to plant different varieties of roses in your garden, you would see that each would bud and bloom at different dates; each would be more or less resistant to drought, to heavy rain, and to all manners of pests and diseases. Vineyards are the same. On the left bank, Cabernet Sauvignon is the principal grape in the majority of fine wine blends. On the right bank, Merlot reigns supreme. The left bank of Bordeaux has a temperate maritime climate with hot summers and mild autumns. The famous vineyards of the Médoc area are protected from cooling Atlantic breezes by coastal pine forests. This is the ideal climate for the late ripening Cabernet Sauvignon. On the right bank, significantly further inland from the coast, the climate is continental with cooler winters and chilling winds. Cabernet Sauvignon struggles to reach maturity here, but Merlot, an earlier ripening variety, thrives, as does Cabernet Franc. Soil types vary widely from one vineyard to another in Bordeaux. Gravelly soils (in temperate areas) work well for Cabernet Sauvignon. They drain water away well, and radiate heat back up to the vines, providing a warmer environment to boost ripening. Clay soils are cooler, retaining water, and absorbing heat. Merlot is better suited to clay. Cabernet Franc can adapt to a wide variety of soils, yielding lighter, fresher wines in sand or limestone rich soils, and bolder, fuller-bodied wines in clay soils. To ensure that each piece of land is used optimally growers plot out these soil and micro-climatic variations and plant different grapes accordingly. The majority of Bordeaux vineyards have a wealth of different soil types. 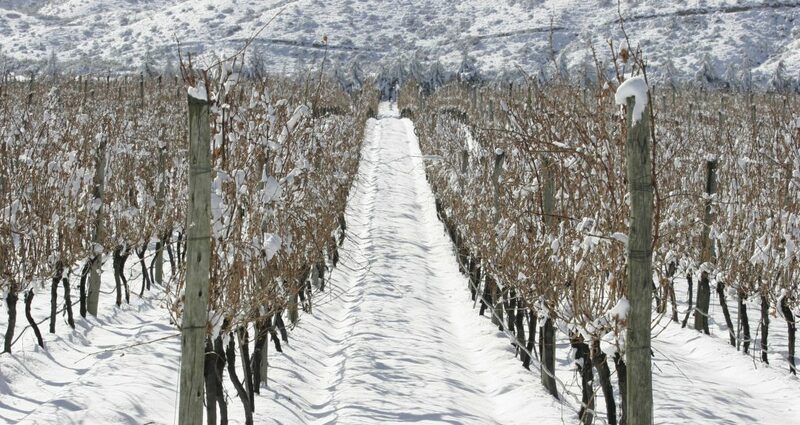 And while the left bank is generally warmer than the right bank, there are many factors that affect the micro-climate of each individual vineyard (orientation, altitude, shelter or lack thereof from wind, just to name a few). To ensure that each piece of land is used optimally – growing grapes that have the best chance of remaining healthy and reaching full ripeness year after year – growers plot out these soil and micro-climatic variations and plant different grapes accordingly. Co-planting provides wine producers with an insurance policy of sorts. If certain parcels attain only marginal ripeness, are ravaged by frosts, or hit hard by rot, higher percentages of healthier, riper grapes can be selected from other vineyard plots to create the season’s blend. While vintage variation is an accepted trait in Bordeaux (see article here), each Château still strives to maintain a sense of stylistic similarity from one year to the next. This forms their reputation, and brings them a loyal following from their patrons. Crafting the vintage’s blend is arguably the most important of the winemaker’s yearly tasks. Fine winemakers ferment each grape and plot separately. The wines are then transferred to barrel to begin their élévage. This resting period in contact with the micro-porous wood allows the wine to soften and harmonize. Crafting the vintage’s blend is arguably the most important of the winemaker’s yearly tasks. Depending on the percentage of new barrels used, their origin, fabrication methods, and so forth, the oak will impart more or less flavouring components (such as cedar or vanilla notes) to the wine. 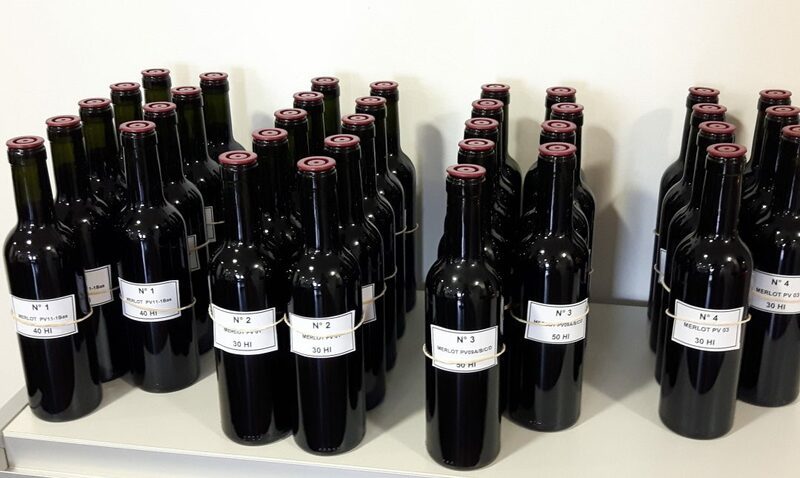 During this maturation period, the winemaker will take samples from each lot and taste them with his team to determine how much, if any, of each parcel will make it into the Grand Vin. This lofty term refers to the top wine of the estate. Lots judged lesser in quality are downgraded to the second and sometimes third wines of the Château. Blending is a veritable art. There are many factors that need to be taken into consideration. The winemaker must calculate the overall quantity of wine required and the volume available of each parcel. They must also consider how the wine will evolve in bottle. An age-worthy Bordeaux requires blending components with fresh acidity, firm structure, and good tannic grip. Tasted early on in their maturation, these elements may appear less seductive, but given time to soften they will form an attractive framework, enhancing the more expressively fruity, plusher lots. Our blending session at Château Petit-Village was, in reality, nothing more than an amusing exercise. The winemakers knew better than to let us loose on their fine wine! Daniel Llose, AXA Millésimes Technical Director, very generously gave of his time to guide us in our endeavors. We tasted through seven different parcels: 5 Merlot base wines from different plots and of varying vine ages, 1 Cabernet Franc, and 1 Cabernet Sauvignon. We then split into two-man teams and got busy with our funnels, beakers, and pipettes, pouring varying amounts of each of our preferred samples into a bottle, thus creating our Pomerol blends. Blending is a veritable art. The winemaker must consider how the wine will evolve in bottle. Pomerol is a small, yet highly prestigious appellation on the right bank. There are just under 800 hectares of vines planted here on a mix of gravel, limestone and clay soils. Château Petit-Village has an enviable position at the highest point of the (low lying) Pomerol vineyards, where the soils are gravelly with optimal drainage. The subsoil here is of particular note. The highly prized “crasse de fer”, an iron-rich clay, is said to impart complex aroma of truffles to the resultant wines. Grapes grown on these soils are the most sought after of Pomerol. After our blends were tasted and politely deemed acceptable by Daniel, we moved on to taste the finished product. Over a sumptuous lunch of roasted duck, we sampled three very fine vintages of Château Petit-Village: 2010, 2007, 2000. Fragrant aromas of ultra-ripe dark plum, black cherry, and blueberry dominate the nose, underscored with licorice, truffle, cedar, and floral notes. Powerfully structured and weighty, with rounded acidity. Velvety in texture, with impressive depth of dark fruit flavours lingering long on the persistent, layered finish. Firm, fine-grained tannins ensure superior ageability. Ageing: 70% new French oak, 30% second use barrels. 15 months. Pretty notes of crushed plum, ripe raspberry, and blueberry mingle with hints of violet and subtle oaked nuances. Quite fresh and vibrant in style, with a full-body, soft, chalky texture, and medium weight, powdery tannins. Not as concentrated as the 2010, but very elegant, with well-integrated oak, and a long, lifted finish. Ageing: 60% new French oak, 40% second use barrels. 15 months. Fully mature, with an attractive tertiary nose featuring earthy, truffle aromas, dried plum, sweet tobacco hints, and exotic spice. Still pleasingly fresh on the palate, with a full-body, and supple texture. A concentrated core of dried floral and savoury nuances marks the mid-palate. The tannins are plush and rounded. Italy is the largest producer of sparkling wine on the planet. With its delicate bubbles, fruity personality, and affordable price, Prosecco has taken the world by storm. No longer reserved for special occasions, sparkling wine is now a popular after-work cocktail choice and brunch pairing. But did you know that Italy also produces sparkling red wine? And, did you also know that sparkling red wine is actually one of the oldest wine styles in existence? Some eperts claim that the Romans purposely left wine-filled amphorae in sunny spots to spur on a secondary fermentation, rendering still red wines slightly fizzy. Other historians claim that sweet, bubbly red wines were more often than not accidental, rather than a function of applied technique. Whatever the historical methods, today’s version is definitely a deliberate, carefully crafted wine style. And it is called Lambrusco. Forget any hazy notions you might have of Lambrusco as ultra-sweet, grape soda-pop wine. The better bottlings on the market today bear little ressemblence to this inglorious past. They remain vibrantly fruity – think tangy red berries and rhubarb – but are much drier, with intriguing earthy, savoury nuances, and an attractive bitter sensation on the finish. They are also quite light in alcohol; hovering around 11.5% for the most part. Lambrusco hails from Emilia-Romagna. This verdant corner of northern Italy is one of the country’s heaviest culinary hitters. Parmigiano-Reggiano cheese, balsamic vinegar, spaghetti Bolognese, lasagna, prosciutto di Parma…these are just a handful of the region’s gastronomic treasures. Confusingly, Lambrusco is both the name of the wine style, and the family of grapes from which it is produced. Over 60 different, related grapes exist in the Lambrusco family. They are all indigenous to the Emilia area, though they are planted more widely today. Lambrusco wines are generally a blend of several Lambrusco grapes, as well as a small percentage (15% or less) of other local varieties. Cabernet Sauvignon is also a permitted, minor blending grape, bringing body and firmer structure to wines. Styles range from secco (anywhere from bone-dry: 0g/L residual sugar, up to subtly fruity: 15g/L), semi-secco (off-dry: 12 – 32g/L), amabile (medium sweet: 30 – 50g/L RS), dolce (sweet: 45g/L +). If you like your bubbly dry, ask your friendly liquor store employee what the wine’s “residual sugar” is before purchasing. They usually have this kind of information on file. Residual sugar is a wine geek’s term for the sweetness level. Anything at 6g/L or less should appear quite dry, while the 6 – 12g/L range should still just give you a ripe, fruity finish rather than intense sweetness. The majority of Lambrusco is made via tank fermentation. This process gives soft, gentle bubbles deemed “semi-sparkling” – or Frizzante in Italian. If you are curious to learn more about sparkling wine production methods (and who isn’t, really? ), check out my “Bubbles” article here for more information. Increasingly, Lambrusco producers are experimenting with other vinification techniques like the “metodo classico” (traditional method bottle fermentation, as in Champagne), and the “metodo ancestrale” (ancestral method, a variant on bottle fermentation). The former produces wines with much more vigourous mousse, and a creamy, layered quality on the palate. The latter is generally semi-sparkling, but with added nuance and textural appeal. I was re-introduced to the exciting world of Lambrusco by the charming Scardova Ermes. As the export manager for leading Lambrusco producer Medici Ermete, Scardova travels the world singing the praises of his fine red bubblies. Medici Ermete is a family-owned winery in Reggio Emilia, with over a century’s experience in crafting fine Lambrusco. They own 75 hectares of vineyards, and also source top quality grapes from long-standing grower partners. They receive regular accolades for their wines, including the top score of Tre Bicchieri in Italy’s famous Gambero Rosso wine publication, over 9 consecutive years, for their Concerto wine. Crafted from the pale, fragrant Lambrusco di Sobara grape, grown on top vineyard sites in the Modena area, this is a lovely apéritif wine. Vibrant aromas of rhubarb, wild strawberries, and herbal notes feature on the nose. The palate is crisp and lively, with delicate bubbles, and a very dry finish. The subtly creamy texture, and hints of baker’s yeast, give this pretty, pale pink bubbly additional appeal. A more robust offering, with a deep purple hue and medium body. Aromas of wild blueberry, candied cherry, and balsamic hints reveal themselves upon aeration. This fresh, delicately sparkling – secco style red- has soft tannins, and a bright, fruity finish (10g/L residual sugar). Made predominantly from a blend of Lambrusco Salamino and Lambrusco Marani grapes, this attractive red hails from one of Medici Ermete’s top estates, Tenuta Quercioli. Medium purple in colour, this weighty offering features elegant floral, crushed raspberry, dark berry, and herbal nuances on the nose. The palate is wonderfully textured, with lots of tangy berry fruit, and fine, subtly bitter tannins. Bright acidity ably balances the off-dry finish (14g/L). Similar sourcing and blend as the previous wine, but crafted in a sweet style. Complex, earthy aromas abound, underscored by ripe plum, prune, balsamic notes, herbal nuances, and mulling spices. Rich and very smooth on the palate, the soft bubbles, and fresh acidity lift this dessert-style wine nicely. Savoury hints add interest on the finish, as do the mildly astringent tannins. These are wines to drink chilled. Medici Ermete suggests a serving temperature of 8 – 10°c. The mix of earthy, savoury notes, gentle tannins, and subtle fruity sweetness (for the secco wines) makes these semi-sparkling reds a fun pairing choice for a wide variety of dishes. Give them a try with a mixed plate of charcuterie and hard cheeses. Salut! Unfortunately, good quality Lambrusco is hard to find on most liquor store shelves. Medici Ermete’s Concerto is available in Québec (17.70$) and BC (19.99$). To enquire about the other wines in their range, contact their regional agents: Italvine in Québec, Profile Wine Group in Ontario, Stile Brands in Western Canada, Kobrand in the USA. An Overview of Italian Wine! Che Figata! If I could only pick one vacation destination for the rest of my life it would be Italy. Hands down. No need to ponder over it. Easy decision. Why, you ask? Because, even at Autogrill, the country’s largest highway fastfood chain, you can get a decent panini, a drinkable glass of wine, and a delicious espresso. The husband and I once spent a fantastic week skiing in the Aosta valley. At the resort restaurant, there was table service, amazing pasta, and hearty reds served in attractive stemware. Oh, and did I mention that it was cheap! I still dream about it. I have traveled to Italy more than a dozen times, and there are still so many places I haven’t seen, or want to re-visit. I love the food, the wine, the coffee, the diversity and beauty of the landscapes, and especially the people. They seem to have perfected a sort of nonchalant confidence that is infectious. And the language! I could sit in a café in a piazza all day, drifting from cappucino, to prosecco, listening to the melodic sound of Italian banter. Learning the language is definitely on my (very long) bucket list. Italy boasts an incredibly diverse wine culture. According to Riccardo Ricci Curbastro of FEDERDOC (Italian agency for appellation wines), over 70% of Italy consists of hills and mountains. This, combined with the limited number of easily navigable rivers, meant that trade between the different regions was slow to develop historically. Each province developed their own foods, and cultivated their indigenous varieties. Italian wine grape expert Ian D’Agata estimates that roughly 2000 different wine grapes are grown in Italy today. From north to south, hill to vale, Italy’s temperate to warm climate makes all regions, including its islands, suitable for grape vine cultivation. 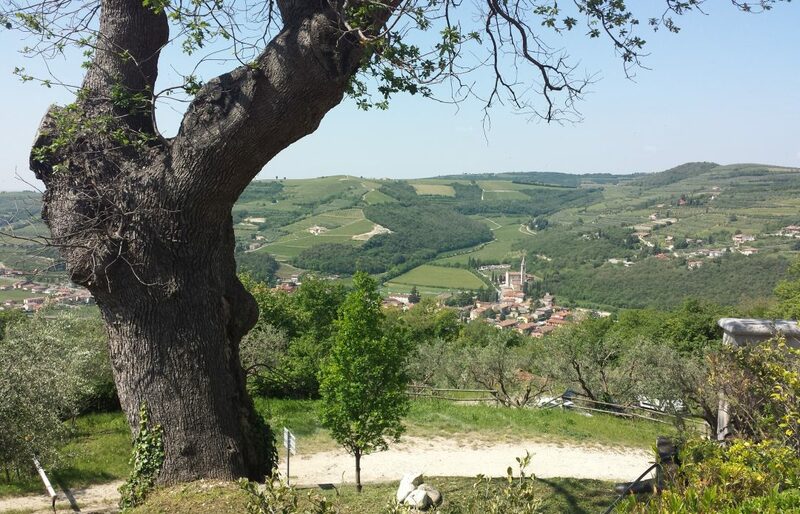 Take a drive down country lanes in any corner of Italy, and you will see vineyards somewhere along the way. Italy is the largest wine producer in the world, beating out its nearest rivals France and Spain. It churned out almost 51 million hectolitres of wine in 2016 (equivalent to 6.6 billion bottles!). That’s a lot of vino. The driving force behind Italy’s prolific output is the popularity of its sparkling wines. Prosecco is the best-selling sparkling wine on the planet, and vast oceans of Asti (formerly Asti Spumante) are shipped around the globe. Italy is also home to a wide number of crisp, refreshing white wines, and an impressive range of dry reds. From Chianti, to Barolo, to Amarone, the list of Italian wines worth a sip (or three) is endless. From cheap & cheerful, to seriously trendy, you’ll discover why all the cool kids are drinking Lambrusco (Italy’s famous red sparkling wine). Women in wine! A feature on some amazing Italian wine divas. So, stay tuned, and thanks for reading! Ciao. Now that you have had a week-end to go out and taste test the 10 great value sparkling wines I offered up last week (if not, click here), it’s time to double down. Yes folks, today’s recommendations get a little pricier! I have, however, restricted the list to wines under 75$, to keep them within attainable gift-giving limits. So, is it really worth spending 20$ to 50$ more? The short answer: YES! That is not to say that all higher priced bubblies are better than their more affordable counter-parts. There are many excellent, small sparkling wine houses that are far superior to some of the major producers. There are also glaring examples of big brand Champagnes that are priced way over their true value. I simply mean that a serious step up in complexity, elegance and finesse often comes when you lay down a couple of extra twenties. It all comes down to terroir and winemaking techniques. When making premium quality wine, grapes are generally sourced from the best vineyard sites, with ideal micro-climates, optimal sun exposure, mature vines, and highly prized soil compositions. For instance, in Champagne the best Chardonnay grapes are said to come from the eastern-facing slopes of the Côte des Blancs. Experts will tell you that the chalky soils here give very fresh, light, elegant whites. The best Pinot Noirs are puported to hail from the western and northern flanks of the Montagne de Reims. Fragrant, robust reds are produced from the limestone soils here. The grapes are harvested within very specific ripeness parameters to yield wines with the right balance of vibrant acidity and bright fruit flavours. Careful sorting in the vineyards and winery ensures that only perfectly healthy grapes make the cut. The blending. 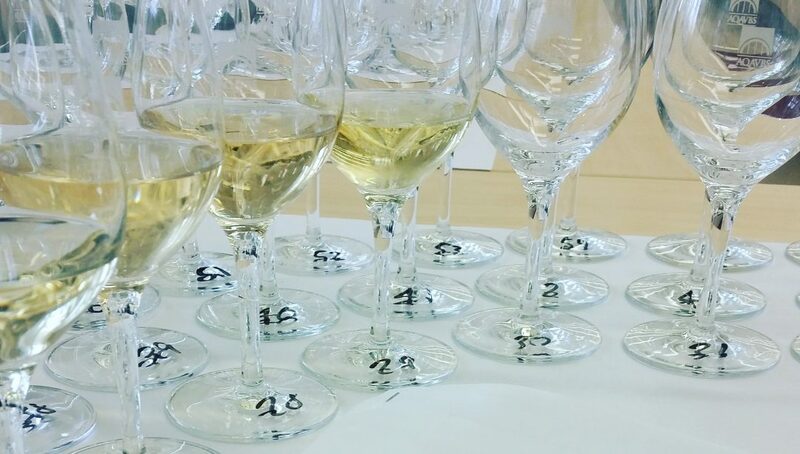 In traditional method sparkling wine production, blending is a complex process! The intial winemaking step, is the fermentation of grapes to yield a dry, still wine (aka “base wines”). Producers regularly keep back a percentage of each seasons’ base wine to age in their cellars. Non-vintage sparkling wines are a combination of the newly fermented dry wine from the years’ harvest, and older base wines from previous vintages. These matured wines are called “réserve wines”. Réserve wines bring added nuance, especially in poor vintages! Depending on the age of the réserve wines, and how much is used in the blend, they can add interesting flavours of grilled nuts, dried fruits, and earthy notes. Once the winemaker feels he has achieved the right balance of fresh and matured nuances in his blend, the wine will be bottled to undergo its secondary fermentation. The maturation. 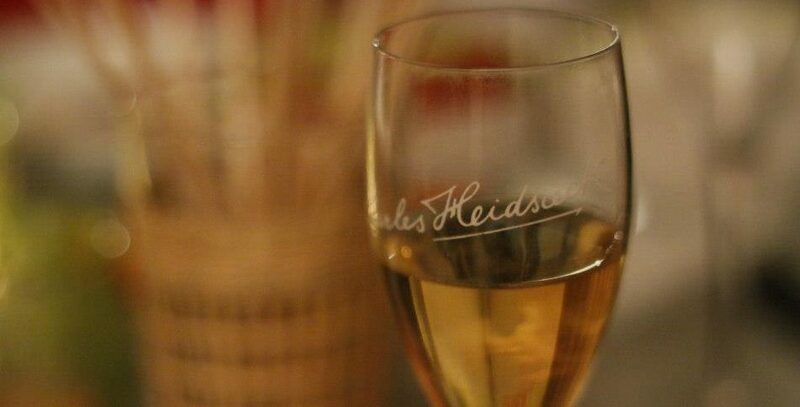 Premium sparkling wines tend to be aged on their lees for many years. This long cellaring period has several advantages. Firstly, as previously explained, they take on a powerful autolytic character (bakery/patisserie-type aromas, rich, creamy texture, and very fine, well-defined bubbles). Secondly, extended bottle ageing gives the various structural components of the wine time to fully integrate. Acidity softens, firm structure mellows, and flavours harmonize. The dosage. Once the cellar master determines that the lees-ageing period should come to an end, a complex process takes place to move the yeast sediment to the top of the bottle so as to be expelled. The bottles are briefly opened, the lees are removed (aka disgorged), and the bottle space is filled with a mixture of wine and sugar called the “liquer d’expedition”. The majority of traditional method sparkling wines today are “brut”, meaning that they have up to 12g/L residual sugar. A popular new trend is the move towards bone-dry styles such as “extra-brut” (6g/L residual sugar or less), or even “zéro dosage” (with no sugar added). While you may think that you prefer your wine as dry as possible, know this: 8 – 12g/L residual sugar is barely perceptible against the searing acidity of many sparkling wines. The no/ low sugar styles can appear overly tart and austere to the uninitiated. There is a wealth of other fascinating reasons why Champagne and other premium sparkling wines are so enticing. I could wax lyrical on the subject all day, but I think the real proof is in the bottle. So without further ado, here are my top 10, premium sparkling wines for this festive season! Chardonnay dominant, with a seasoning of Pinot Noir and Pinot Blanc. Moderately intense, featuring attractive white floral notes, bosc pear and hints of buttery pastry. Very fresh, with vigorous bubbles and a broad, layered mid-palate and dry finish. Made from 100% Chardonnay, and aged on its lees for 5 years, this opulent sparkling wine offers a rich texture, and tempting flavours of baked apple, ripe lemon and toast. Wonderfully vibrant acidity and fine, persistent mousse balance the concentrated fruity, toasted core nicely. Very elegant for the price, with mineral nuances, white floral notes and orchard fruits on the nose. Crisp and light-bodied, with laser-like focus, and a zesty core of lemon and green apple. Bone dry, with lingering stony minerality. A richly textured style, blending the three major Champagne grapes: Chardonnay, Pinot Noir, Meunier. Enticing aromas of hazelnut, red apple and brioche on the nose. Medium bodied, with brisk acidity, a creamy, concentrated mid-palate, and very fine, lingering bubbles. Mostly composed of hybrid grapes (capable of surviving our challenging winters), Benjamin Bridge Brut is an incredibly vibrant, citrus-driven sparkling. Searing acidity and vigorous bubbles feature on the light weight palate. A zesty core of ripe lemon and subtle mineral nuances linger through to the clean, dry finish. Somewhat restrained, developing tart orchard fruit, hints of red berries, and green almond notes upon aeration. This is a very clean, precise, bone dry Champagne with racy acidity and a long, mineral-laced finish. Well-delineated, elegant bubbles give breadth and elegance to this exclusively Pinot Noir based cuvée. Great choice for oysters! This Chardonnay-led blend offers a lot of finesse for the price. Alluring aromas of grilled nuts and toast interweave beautifully with bright red apple and white blossom notes. Incredibly vibrant on the palate, with a firm structure, softened by the smooth, layered texture. The finish is long and wonderfully fresh. Charles Heidseck (not to be confused with Piper!) is a rich, golden hued Champagne crafted with 40% Réserve wine. This brings intriguing blend of bright yellow fruits and freshly baked bread, with attractive tertiary notes of dried fruits and toasted almonds. The palate is zesty, medium bodied, and very concentrated, with attractive, persistent bubbles. Bonus (if gift giving or trying to impress guests): the new label is very classy! Where to buy: LCBO (69.95$), agent: Breakthru Beverage Canada (sold out in QC, enquire with agent). One of my perennial favourites, Louis Roederer Champagne never fails to impress. This Pinot Noir and Meunier led blend is highly complex, featuring notes of brioche, delicate red berries, and orchard fruits, underscored by intriguing nutty aromas. Searing acidity, firm structure and vibrant bubbles, are expertly balanced by the rich, creamy texture and concentrated, toasty core. Very opulent, hedonistic style featuring equal parts Chardonnay/ Pinot Noir, and a small percentage of Meunier. Highly autolytic in character, with pretty yellow apple, ripe lemon, and ginger spice adding complexity. Zesty and firm on the palate, with a creamy texture, impressive depth of flavour, and very fine, persistent mousse. Where to buy: SAQ (73.00$), agent: Réserve & Sélection. (What does LW stand for? Click on my wine scoring system to find out). WHAT’S ALL THE FUSS ABOUT WINE ANYWAY? In today’s saturated global marketplace, we are spoilt for choice when it comes to alcoholic beverages. Beer, cider and spirits, like wine, all have their devout clientèle. In fact, in many places, wine sales pale in comparison to these giants. If intoxication is your main goal, they all ‘do the job’, often much more cheaply and quickly than wine. And each drink has its band of enthusiasts who prefer the taste of their chosen tipple. So, why does fermented grape juice hold such an exalted position in the hearts and minds of enthusiasts the world over? Wine has a number of powerful assets that differentiate it firmly from other inebriants. Its perceived quality, authenticity and luxury, its uniqueness – with no two wines ever quite the same, the wealth of interesting new developments to appeal to the new information hungry, internet generation, wine’s image as a health conscience beverage. I could go on, but will spare you any further evidence of my propensity to ramble. The earliest evidence of cultivated vines date as far back as Georgia circa 6000 B.C. (click here for more information). In ancient Egypt beer, made from Barley loaves, was the drink of the masses. Only the wealthy elite could afford to drink wine. This trend is seen through out history, with the poor drinking cider, mead and beer in Medieval England, while the nobles drank wine. Wine’s symbolic association with luxury, remains a persuasive sales incitement for the upper classes in many developing markets, like China, today. Another facet of what drives consumers to value wine so highly is its perceived authenticity and rarity. The Schloss Johannisberg estate of the Rheingau was founded around 1100, while Louis Latour has been passed down from father to son in Burgundy since the 1700s. Owning a wine from a generations-old estate feels to many like holding a piece of history in one’s hand. Regions like Burgundy, where many growers have as little as a few ares of different vineyard parcels, introduce a notion of scarcity for certain top wines. In a 2014 Sotheby’s Hong Kong auction, a parcel of 114 bottles of Romanée-Conti sold for a whopping 1.6M $. While certain spirits can claim high retail prices, low production volumes and a long history of high quality, none have such a long and storied past. Whereas the majority of beers, ciders and spirits strive to offer a consistent style and quality from one batch to the next, wine is the only beverage that has introduced the notion of bottlings by vintage. Variation in colour, aromas and flavours from one year to the next is not only accepted, but is indeed a major part of the fascination for many collectors. En primeur week in Bordeaux, where wine is pre-sold from barrel before release, is a major part of the global wine trade calendar, stirring buyers and media alike into a frenzy. Every winemaker and wine lover will tell you stories of their greatest vintages…the 1977 Dow’s vintage port, the 1945 Château Latour and so on. Just ask any winery what a popular critic’s judgement of the region’s vintage can do. When the Wine Spectator ran a feature on the excellent quality of 2010 in the Southern Rhône Valley, purchase requests flooded into Domaine de Longue Toque in Gigondas. The evolution in style, from one year to the next, keeps wine collectors hooked. Terroir…a term that intimidates and impresses novice wine lovers in equal measures. No wine expert has every successfully summed up the concept in simple, concise terms. And this is a major part of its appeal. No one dares to refute a claim that they don’t fully understand! Wine connoisseurs world-wide grow starry-eyed detailing the aromatic qualities imprinted on a wine by a specific soil type, weather pattern, altitude, and so forth. They speak confidently of Rutherford dust, Coonawarra terra rossa, and the slate soils of the Mosel. The vertiginous slopes of the Côte Rôtie and the patchwork of individual Burgundian climats are familiar and well understood arguments for the superior quality of the region’s wines. Many beer, cider and spirits brands also claim certain aspects of weather and soil as the secret to their flavour. There is no denying the powerful aromatic effect the peat-rich soils of Islay have on local whisky’s like Laphroaig. But what lacks, in comparison to wine, is a consolidated approach adhered to by the entire category. Check any winery’s website and they will undoubtably boast of unique soils or old vines or ideal climate…some factor of “specialness” attributed to the vineyards and site. Yet another point of differentiation for wine is the sheer number of different grape varieties and wine styles available. Estimates vary, but there are said to be over 10 000 different wine producing grapes. Styles vary from white, rosé and red to still, sparkling, late harvest, fortified, botrytis-affected and so on. The sheer wealth of choice, from grape, to style, to vintage, to terroir, makes wine an endlessly appealing, singular beverage category. With the rise of vineyard plantings in countries around the globe, a new generation of passionate, innovative winemakers has arisen. In my grandfather’s generation, outside of a handful of prestigious regions like Bordeaux or Champagne, the grape grower and winemaker were rarely viewed as more than peasant farmers. Nowadays, they are revered creatures, adorning glossy wine and lifestyle magazines. These new champions are keen to share their love of all things wine with all who will listen. This plays nicely to the information hungry, internet savvy Millennial consumer. Blind allegiances to specific appellations, estates or wine shop recommendations are a thing of the past. Today’s young wine drinkers research. They want to know as much as possible about what they are buying. From vintage reports, to blending variations, to emerging vineyard areas, to new grape plantings, today’s wine trade has never had so much to say, and such an enthusiastic audience. The rise of sommeliers and chefs as gatekeepers to fashion in alcohol sales is also a boon for wine. Whereas beer and cider are traditionally categorized as pre-dinner or bar drinks, and many spirits proferred as digestifs, wine is considered the perfect mate for the main event…the meal. This gives wine a strong advantage, making it as much an everyday, rather than occasional, refreshment. 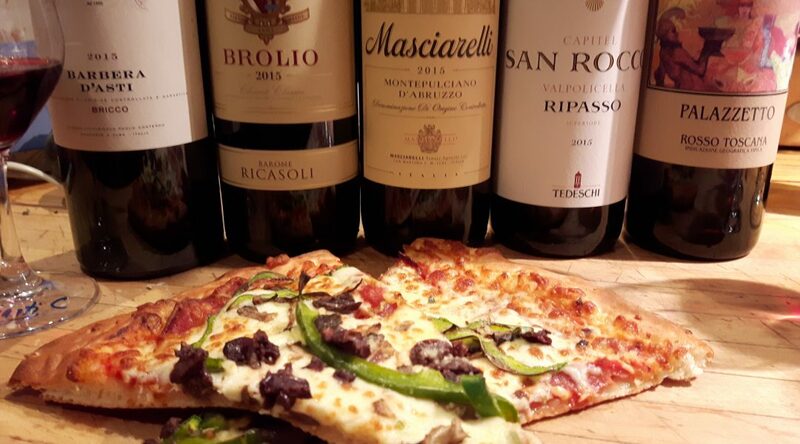 Given the aforementioned stylistic array of wines available, there are food pairing options for every type of cuisine from aromatic whites for Asian dishes to big Napa Cabs for steak. Famous French scientist, Louis Pasteur, declared wine to be the healthiest, most hygienic of beverages. He advocated wine over water in a time where contaminated water sources led to many disease epidemics. 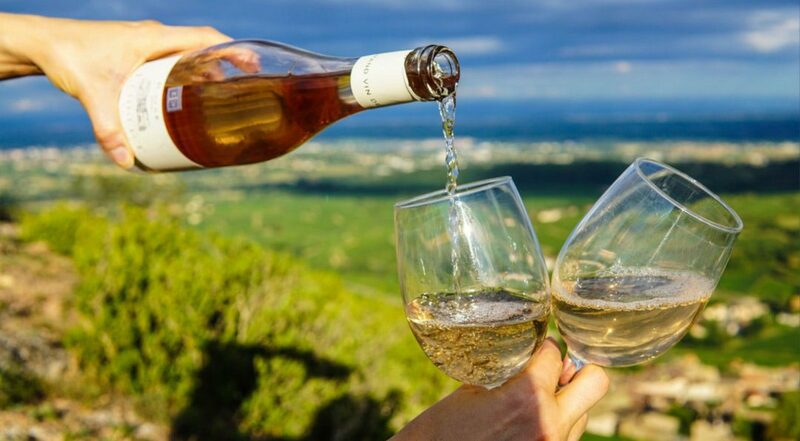 More recently, the concept of the French Paradox, the antioxidant effects of the polyphenol Resveratrol, has revived the connection between wine and good health. Studies abound that show a correlation between moderate wine drinking and decreased levels of heat disease, stroke, diabetes, and so forth. In a recent Wine Intelligence survey of Chinese wine consumers, the purported health benefits of wine are given as a major reason consumers are switching from whiskey and beer to wine. At 8 – 14% alcohol, as compared to 35 – 50% for most Vodkas, wine is considered a lower alcohol alternative. This is a strong sales argument in cultures like the UK where binge drinking is an ongoing problem. Beer and cider can also lay claim to the argument of lower alcohol levels, but generally carry more calories for equivalent alcohol by volume. While competition is fierce amongst alcoholic beverages, wine has a number of compelling features that allow it to stand out from the crowd. Wine carries powerful affiliations with notions of luxury, rarity and authenticity. It is unique in its concepts of vintage and terroir variation. The multitude of different grape varieties and styles further set wine apart. And the rise of the winemaker and the sommelier as trendsetters also play their part. Lastly, wine is the most popular alcoholic choice for health conscience consumers. Beer may quench my thirst on a hot summer’s day, and cocktails are a fun choice for ladies night out, but wine will always have my heart.